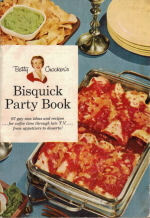 Here is page 21 of the vintage cookbook: Betty Crocker’s Bisquick Party Book that was published in 1957 by General Mills. Heat oven to 350° (mod.). Melt chocolate, butter. 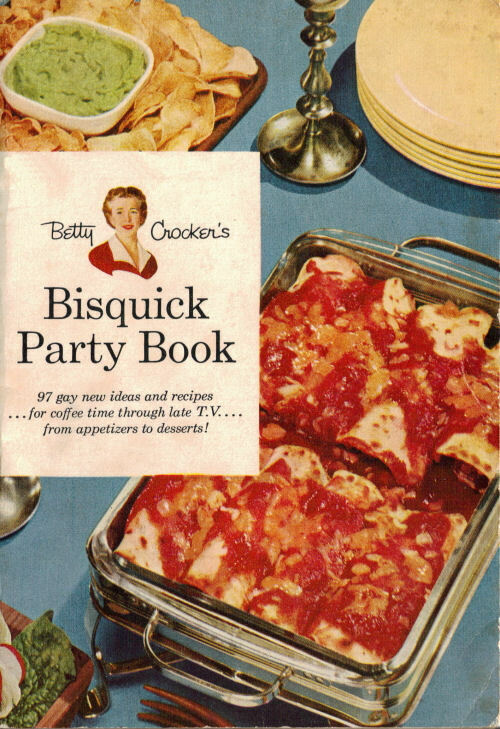 Mix in sugar, eggs, Bisquick, nuts. Spread in 8 or 9″ greased sq. pan. Bake 30 to 35 min. Brand new with Bisquick. Our testers raved! Heat oven to 375° (quick mod.). Mix Bisquick, butter, nuts, flavoring. Add water; stir with fork until dough forms a ball and cleans the bowl. Shape into 24 balls. Bake 10 to 12 min. on ungreased baking sheet. While warm roll each ball in confectioners’ sugar. Makes 2 doz. Heat oven to 375° (quick mod.). 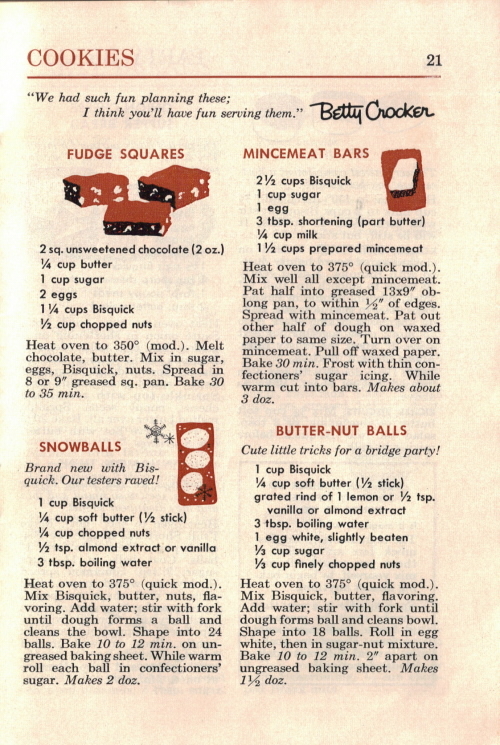 Mix well all except mincemeat. Pat half into greased 13×9″ oblong pan, to within 1/2″ of edges. 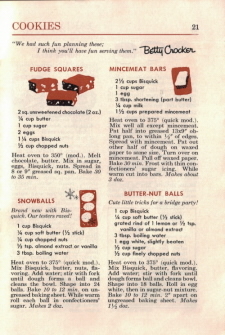 Spread with mincemeat. Pat out other half of dough on waxed paper to same size. Turn over on mincemeat. Pull off waxed paper. Bake 30 min. Frost with thin confectioners’ sugar icing. While warm cut into bars. Makes about 3 doz. Cute little tricks for a bridge party! Heat oven to 375° (quick mod.). Mix Bisquick, butter, flavoring. Add water; stir with fork until dough forms ball and cleans bowl. Shape into 18 balls. Roll in egg white, then in sugar-nut mixture. Bake 10 to 12 min. 2″ apart on ungreased baking sheet. Makes 1 1/2 doz.